MY KITCHEN IN SPAIN: CELEBRATE SANTIAGO DAY! 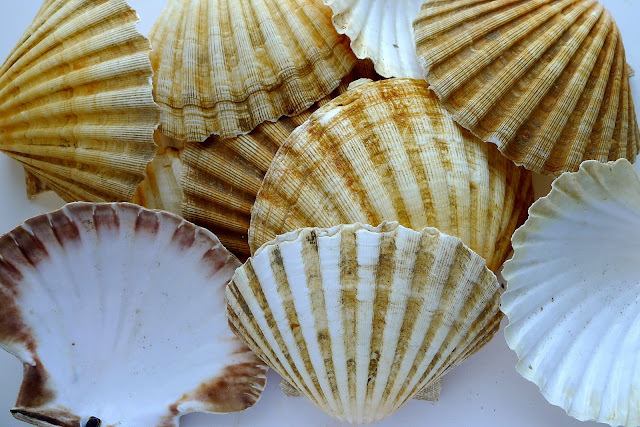 Scallop shells are a symbol of pilgrimage to the shrine of Santiago (St. James). Happy Santiago Day! Today (July 25) is the festival day of Santiago, St. James Apostle, patron saint of Spain. The holy shrine of St. James in Santiago de Compostela, tucked in Spain's far northwest corner, has been site of religious pilgrimages since medieval times. Nowadays, the Camino de Santiago, which crosses from the French border through northern Spain, attracts trekkers both religious and secular. I’ve never walked the ruta jacobea, the pilgrim’s route, but I’ve made my gastronomic pilgrimage to Santiago. 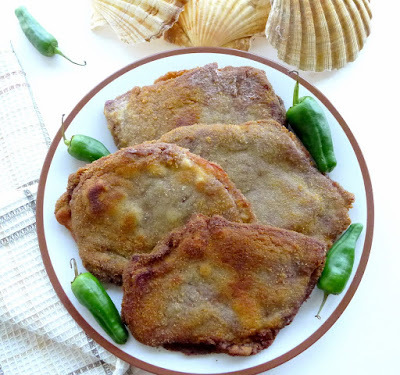 I chose a recipe for veal cutlets—Escalopes San Jacobo—to celebrate the day. Diego, Jaime and Jacobo are all variations of the name “James” in Spanish. 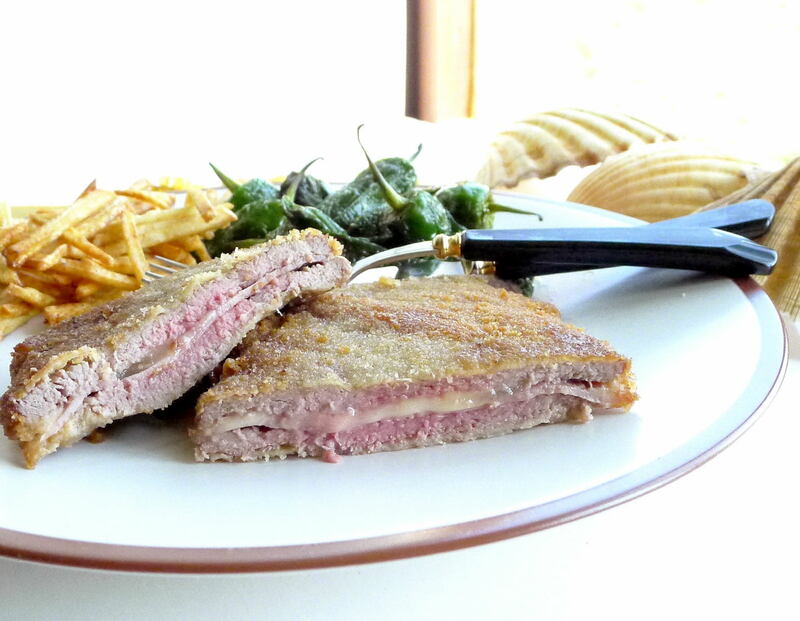 Escalopes San Jacobo are breaded veal cutlets with ham and cheese. How in the world did this nowhere place on the Iberian peninsula, Finis Terrae, at the western edge of the then-known world, come to be almost as important as Jerusalem and Rome in the realm of the church faithful? St. James the Apostle (Santiago in Spanish) supposedly came to Spain to preach the Gospel, then returned to Jerusalem in the year 44 AD, where he was beheaded by order of Herod. After his martyrdom, tradition says his sepulcher was transferred to a ship, which, steered by angels, reached Galicia’s Atlantic coast and traveled up the River Ulla to the Roman town of Iria Flavia. There the sepulcher was interred and remained undiscovered until early in the 9th century, when a brilliant supernatural light appeared to a pious hermit, leading him to the burial place of the saint. The appearance of the star caused the site to be named campus stellae, star field, or Compostela. A church was built at the site of the tomb, and news of the discovery of St. James’s tomb spread rapidly through Spain and across the Pyrenees into France and beyond. Miracles, visions and healing were attributed to the Saint. The discovery of the Apostle’s tomb came at a time when the Muslim invasion of Spain was gaining ground, with the Moors threatening European Christendom. A mustering of the faithful in pilgrimages was one way to keep the infidels at bay and to protect and strengthen these small Christian kingdoms in the north of Spain against the spread of the Moorish strongholds. One legend that persisted was that of St. James as the Moor-slayer. The legend got its start in the Battle of Clavijo, when King Ramiro I defeated the troops of the Moorish king, Abderramán II, aided by a knight riding a white steed, who fought alongside him and turned the tide of the battle. According to legend, the knight turned out to be none other than St. James. Sanctifying journeys to holy shrines began with pilgrimages to the Church of the Holy Sepulcher in Jerusalem. But, by 1078 the Turks seized the Holy Sepulcher, halting the traffic of pilgrims to that holy site. After that, the military orders of crusaders were the only ones to visit there, so ordinary pilgrims and penitents turned elsewhere. After the 11th century, Santiago became the main destination for pilgrims throughout Christian Europe, attracting kings, princes, knights, prelates, monks as well as the faithful of ordinary classes. The pilgrimages reached their height during the 12th and 13th centuries. Those who made the journey were assured automatic absolution. The Pilgrims’ Way to Santiago brought the development of Romanesque art and architecture, of Provençal poetry, of legends, literature and troubadours, of commerce, all of which shaped the life of Europe in the Middle Ages right up until the Renaissance. The establishment of numerous monasteries as way-stations on the pilgrim route did much to further the development of wines. Monks and pilgrims may have brought in grape varietals from elsewhere in Europe and, too, they may have taken indigenous ones back with them. For example, the Galician Albariño grape, from which is made what is arguably Spain's best white wine, is sometimes said to be the original Rhine wine grape, rather than vice versa. Spain’s first guidebook was the Codex Calixtus, written by a French priest in the first half of the 12th century, which provided, besides background information to the legends of the saint, much practical advice to pilgrims--best routes, where to stay, what to eat and drink. Inside the veal cutlets, melted cheese and ham. 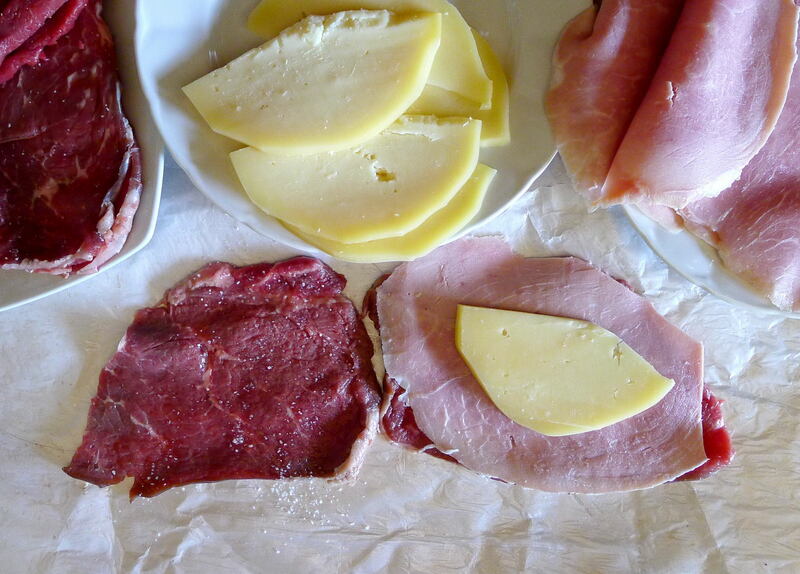 The dish consists of thin frying steaks of veal (actually, young beef, not white veal) that are pounded thin, then sandwiched with sliced ham and cheese. After coating with breadcrumbs, they are fried until crisp. San Jacobos used to be an especially popular dish along the Camino, especially in Navarra and La Rioja. Nowadays they’re more likely to turn up in the frozen foods section of the supermarket, made with chicken instead of veal. I never did find an explanation of why these veal cutlets are named for St. James. Though, curiously, in Asturias a similar preparation is called “cachopo.” I wonder which came first, "jacobo" or "cachopo." I used cutlets from the babilla, a cut from the leg. 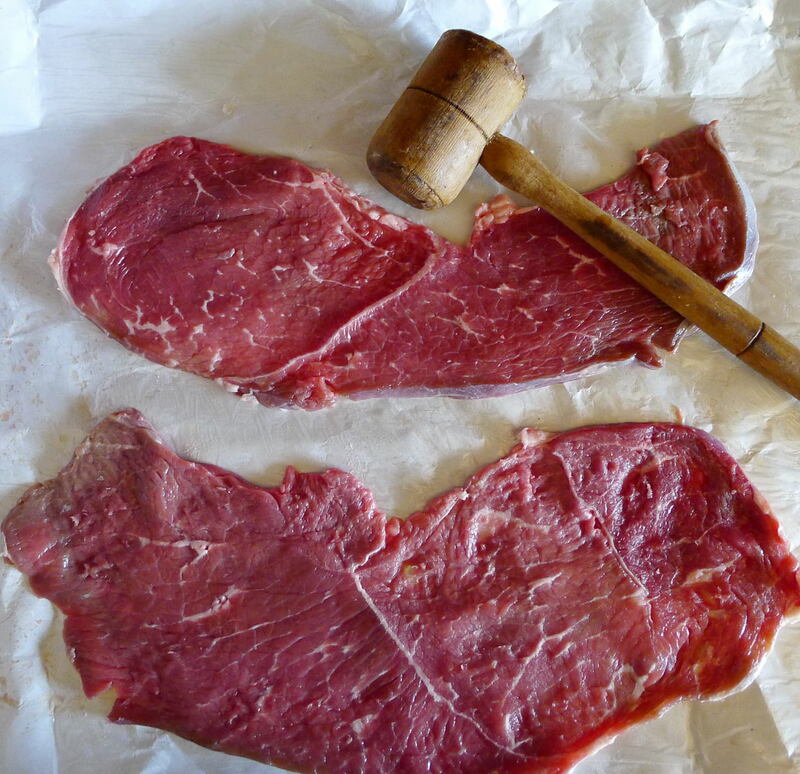 Any thin frying steak from the top round or rump will work. These were big fillets. They can either be cut in half or each one folded over the filling. Pounding the fillets helps to tenderize them. Sliced cooked ham (in Galicia, lacón) goes in the filling with any good melting cheese. I used San Simón cheese, a lightly smoked cow’s milk cheese from Galicia. That touch of smoke was brilliant. I cooked only four of the San Jacobos. The other two, once breaded, I wrapped and put in the freezer for another meal. Bottom cutlet has been flattened. Remove any membrane from the edges of the cutlets. Spread them on plastic wrap or greaseproof paper and pound with a meat mallet to a thickness of 1/8 inch. Place one cutlet on top of another, matching the shapes. Cut them in half crosswise, making 6 double cutlets. Sprinkle with salt and pepper. Sandwich ham, cheese between cutlets. Open up the paired cutlets. Place a slice of ham and slice of cheese on one half. Top with the matching cutlet. Press the edges together around the filling. Sandwich ham and cheese between the remaining cutlets. Place flour in a shallow bowl. Add ½ teaspoon salt and the thyme to the flour. Place the beaten eggs in another bowl and the bread crumbs in a third bowl. Dip in flour, egg, crumbs. 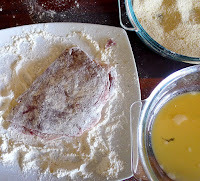 Dredge one cutlet “sandwich” first in flour and pat to remove excess. Dip in beaten egg, letting excess drain off. Then dredge in breadcrumbs, making sure to bread the edges of the sandwich. Place it on a tray. Repeat with the remaining cutlets. Refrigerate the tray of breaded cutlets, uncovered, for at least 30 minutes or up to 2 hours to allow the breading to dry slightly. Place oil to a depth of 1 inch in a skillet (use a small skillet to cook one cutlet at a time or a large one to cook 3 cutlets at a time). Heat the oil until shimmering, but not smoking. Fry the cutlets until golden-brown, turning only once, about 1 ½ minutes per side. Remove and drain on paper towels. Serve hot. 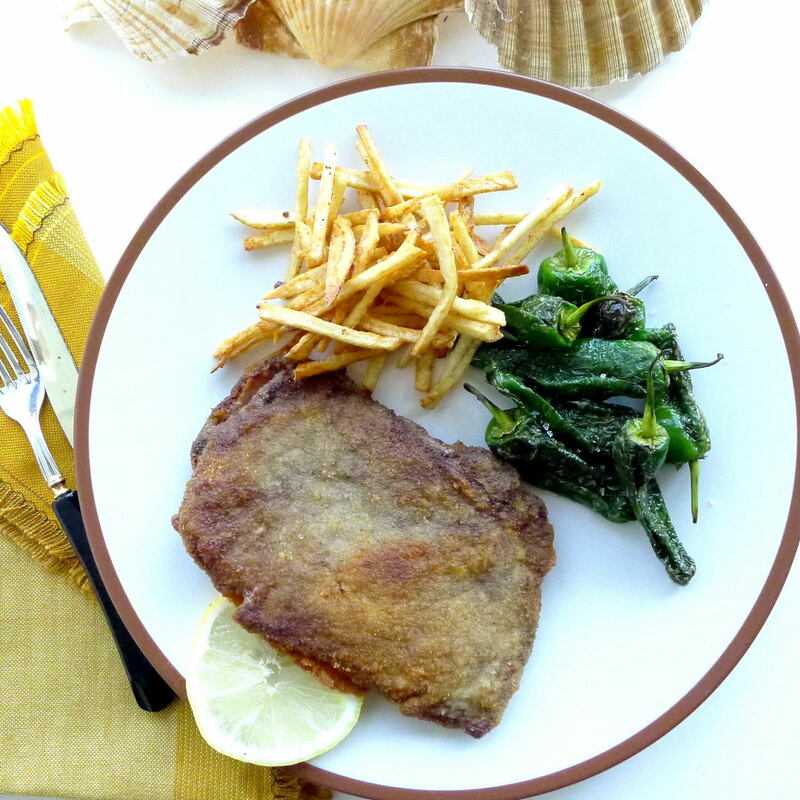 Serve cutlet with shoestring potatoes and fried Padrón peppers. Seafood bay (small) scallops are my favorite. One way I like to do them borrows from Mexico: Broil the scallops. On a fried corn (Mexican) tortilla (or better, a corn tortilla bowl) add shredded lettuce, tomatoes, green onions and the scallops. Add either a good salsa or vinaigrette. David: Bay scallop tacos sound great! I´m going to look for some frozen scallops this week, to fill those beautiful shells in the photo.